Fighting the clock and a seven-point deficit, it came down to the last 1:13 of the game. With quarterback Julien John in the pocket and a young, inexperienced offence in front of him, he did what he had done for the last two and a half hours, he called a play. The no-huddle offence was ready; it was the Wilfrid Laurier Golden Hawks last possession of the game, they were trailing 27-20 and they had one last chance for a touchdown to tie — or potentially win– against the visiting Toronto Varsity Blues. But John was sacked and then Kelvin Muamba let a catch slip out of his hands. A turnover on downs with 28 seconds left in the game would seal the fate for the Golden Hawks, and it would hand them another loss. 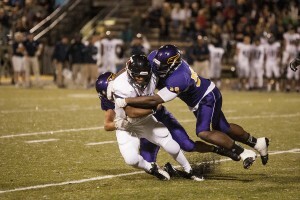 A 27-20 loss. An 0-2 record to start the season. It was as if two Laurier teams played the Varsity Blues tonight, as the first two quarters were filled with a comedy of errors. Kicker Ronnie Pfeffer attempted a 43-yard field goal, but an awful snap and hold forced the kick to be blocked. Then, midway through the first quarter, Toronto would go ahead 7-0 after they picked up their first touchdown of the night from Paul de Pass after a 65-yard run to put them in the red zone. The second quarter was much of the same, with a fury of penalties and mental errors on both ends. However Pfeffer would find the uprights on a 25-yard field goal to cut Toronto’s lead to three. Midway through the frame, Toronto would connect for their second touchdown of the night when Alex Pierzchalski received a beautiful pass from runningback Aaron Milton to go ahead 14-3. Things would just get worse for Laurier when kicker Eric Hewitson connected on a 32-yard field goal with less than five minutes left in the half to put Toronto up 17-3. It would take another touchdown by Toronto’s Pierzchalski and another field goal from Hewitson- which would make the score 27-3 — before Laurier would find their second life. But when they did, there was a new team on the field. First, with less than four minutes left in the third quarter, John would connect with Nyhof for his first-career pass and Nyhof’s first-career receiving touchdown to close the gap to 17 points. It was a 27-10 game. Nyhof’s touchdown was also the first offensive touchdown Laurier has scored since Homecoming of 2012, when the Hawks entertained the Gryphons on Sept. 29. The Hawks went 24 and more than half quarters without an offensive touchdown. The fourth quarter saw more from Laurier, as Anthony Pizzuti caught a 38-yard pass from John for the second touchdown of the game. With the momentum behind them, the Hawks tried to use the new-found tempo and their timeouts to move up field. When within range, Pfeffer came out to score a career-high 45-yard field goal, putting the Hawks within seven of the visiting Varsity Blues. 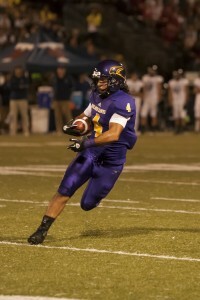 But the comeback could not be finished, and Laurier would lose 27-20. Although the Hawks failed to win, there were a few silver linings in a game of errors. Laurier had 23 first downs, 382 yards of passing — both more than Toronto had — and 433 total offence in the game. 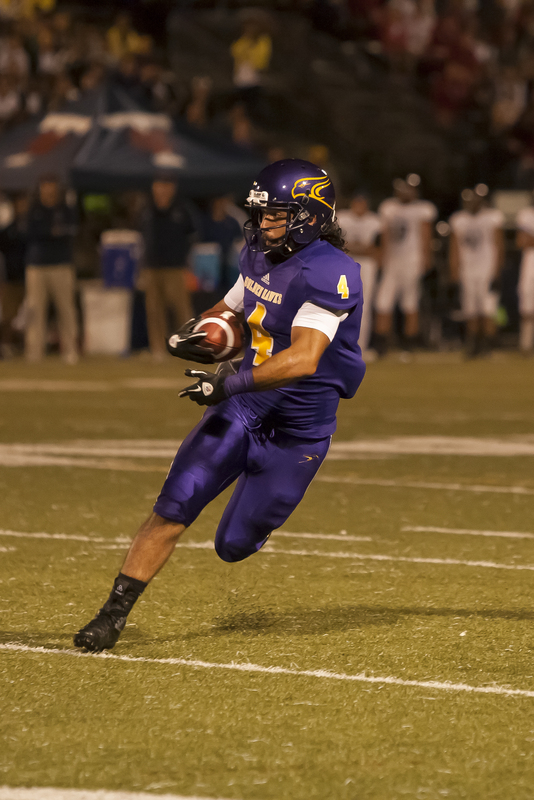 Laurier will visit the York Lions on Saturday in a 1 p.m., kick off.